James Baldwin has served as Flint Township Police Department Lieutenant since his promotion in 2014. He has served both as Patrol commander and currently serves as commander of Investigations and Operations. Among his current responsibilities is being Project Director for two multi-agency grants in which the department participates; the U. S. Justice Assistance Grant (JAG) and the Genesee County Traffic Safety Grant, through the Michigan Office of Highway Safety Planning (OHSP). Lieutenant Baldwin was hired by the Flint Township Police Department and has served the residents of Flint Township since 1997. As a patrol officer, he served in many assignments including Patrol Officer, Community Police Officer, School Resource Officer, Investigator and Incident Response Team (IRT) member. In 2009, he was promoted to the rank of Sergeant and served as both a Patrol Sergeant and Detective Sergeant. 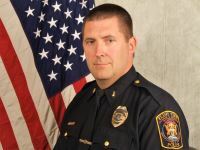 Lieutenant Baldwin earned his Bachelor of Science degree in Criminal Justice from Lake Superior State University in 1996. Prior to being hired by Flint Township, he worked as a Patrol Officer for the Sault Ste. Marie, MI Police Department. Lieutenant Baldwin is a 2017 graduate of the Federal Bureau of Investigation National Academy, Session #268.